The Amazing Spider-Man 2 has webbed its way into theaters. I wanted to give it the best possible chance to impress me, so I saw it at the drive-in. That seemed the sanest course. And, as far as entertainment goes, the drive-in worked. It was far more entertaining than The Amazing Spider-Man 2. I made my own popcorn! Bug on a windshield. What a cliché. The Amazing Spider-Man 2 is a film in which the enemy is either all electrical noise, or an utter moron encased in way too much leaden technology, or someone so desperate to live that he’ll do his best to kill himself in order to survive. You may choose which of those villains best serves as an apt comparison to Mark Webb’s follow-up film in this under-ripe reboot of the Spider-Man franchise. If you would like more information, following I have prepared a list of the 10 critical things you need to know about The Amazing Spider-Man 2, starring Andrew Garfield, Emma Stone, Jamie Foxx, and Dane DeHaan. 2. The vast majority of the film’s scenes involve someone narrating what they’re doing and who they are in case you want to watch the film with your head buried in a sack of mealworms. Wait. Do I have something on my face? 3. While there are a few innovative effects shots of Jamie Foxx’s Electro getting his shock on, the computer graphics are so ubiquitous in The Amazing Spider-Man 2 that it’s more like watching a screensaver than an action movie. 4. The action scenes — being so digitally fabricated — are somewhat less emotionally involving than watching a screen saver. Particularly if you’ve got that one with the flying toasters. Why hasn’t that been made into a movie yet? 5. When someone turns on their headlights at the drive-in, it’s irritating and people honk their horns, which is also irritating, unless the movie you’re watching is terrible and you don’t really care. I didn’t really care. The drive-in is awesome. If I was going to be a superhero, my super power would be Emma Stone. 6. Emma Stone and Andrew Garfield have some engaging chemistry in the few scenes they share that aren’t swamped with digital noise. Far and away, Emma Stone is the best thing about The Amazing Spider-Man 2. She is talented and fetching and she’s welcome to come over any time she likes for lemon biscuits. 7. Screenwriters Alex Kurtzman, Roberto Orci, and Jeff Pinker have a problem with subtlety. None of the characters in The Amazing Spider-Man 2 does anything by half-measure. They are filled with hope or absolutely overcome with rage. They are the most pathetic individual on the planet or so full of themselves they will face off with a man who has turned into living electricity over office politics. This does not make things dramatic. It makes them tedious and far-fetched. 8. At the drive-in, they say ‘no alcoholic beverages’ but that’s more of a suggestion than a rule. 9. Sally Field can still drop the emotional bombs when the situation arises. Her big scene was no more sensible than anything else in The Amazing Spider-Man 2 but she managed to come across like a real person in a real situation. Dane DeHaan also had a couple of good scenes before they turned him into a Troll doll. 10. If you’re going to die on a plane after accidentally developing bio-weaponry and have one chance to upload something to a server, a two-minute video clip proclaiming your innocence is probably less of a good choice than data, particularly if you’re uploading it to a server hidden in an underground laboratory in a hydraulically submerged subway car in an abandoned station which no one knows exists. How do you like my Troll doll costume? I realize it’s in vogue to trash Sam Raimi’s Spider-Man movies, but his Spider-Man 2 was so far superior to this latest one it’s almost shameful to compare them. Alfred Molina is a real actor and his Doc Oc had a coherent character and motivation. 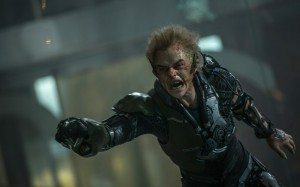 I remain resolutely unclear why it was so important for any of The Amazing Spider-Man 2‘s three villains to want Spider-Man dead. Maybe they just were hoping that would mean they wouldn’t have to be in the third film? In conclusion, the only thing that’s important to know about The Amazing Spider-Man 2 is that not even seeing it at the drive-in will make it a good movie. again, the inverse relationship of numbers of villains in a superhero movie to the quality of said movie. is that bell curve? how many villains do we need in order get back to good quality? what if the thousands of villains are all clones of Gary Busey? because i want to see that movie. well, matrix 2 had the burly brawl with like thousands of agent smiths. you be the judge. A Matrix quote comes to mind quite naturally: DODGE THIS! You must know kung fu? The last movie I saw at a drive-in was Karate Kid II. My friend and I sat on the roof so my mom could make out with her boyfriend. Anyway, now that I know there is still a drive-in in existence, I need to see something that will erase that entire experience from my mind! I have a fairly amazing drive-in story. But we’ll be going again! We should organize a drive-in party. People there brought folding tables and full meals and it WAS AWESOME. Drive-ins still exist? That’s what I get for living in the middle of nowhere. We did have a bar called the Ho-Down, but it’s gone now. Yeah. We got us a drive-in still. It’s 45-minutes away, but man, is the sound terrible. We go as often as we can. I am very sorry to hear about the Ho-Down. Condolences on your loss.